Cosmetic Dentistry consists of any form of dentistry that deals with aesthetics. While most dentists will tell you that everything we do in dentistry deals with aesthetics, there are several aspects of dentistry that specifically fall into this category. Below we outline a few of the major types of treatments available at Weldon General and Cosmetic Dentistry in Ocala, Florida. Teeth whitening is one of the least expensive and most effective ways to brighten a smile. Teeth can become discolored from a multitude of reasons. In addition to normal discoloration that occurs over time, staining can become accelerated by certain foods and drinks like coffee, tea, and certain juices. In addition, teeth can become significantly stained from tobacco use and certain antibiotics. 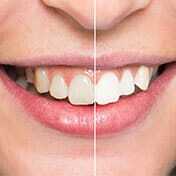 Professional whitening is either done in office or at home. At Weldon General & Cosmetic Dentistry, we offer in office whitening using Opalescence Boost technology. This can provide results in about an hour. The procedure for take home whitening is relatively simple. First, the dentist will make impressions of the teeth and gums. From there, custom soft thin comfortable whitening trays will be made. Dr. Weldon provides whitening gel to take home. A small amount of whitening gel is placed inside of the trays and the trays are worn for the specified period of time. While there are some special circumstances where teeth whitening is more challenging and certain times when teeth are resistant to the whitening gel, professional teeth whitening really works. If you would like more information, feel free to visit our page on whitening! It seems today that every magazine, television program, and movie you watch is full of people with straight beautiful smiles. Many of these smiles are in part the result of veneers. Veneers are an incredibly effective cosmetic dentistry treatment when used in the right situation. A veneer is an extremely thin (usually 1/2 millimeter) porcelain shell that is placed over the teeth. Veneers can mask, cover, or correct misaligned, discolored, cracked, chipped, or rotated teeth. While there are limitations to veneer treatment, when used appropriately the results can transform a smile. If you would like to read more about veneers, visit our services page on veneers! A crown is a cap placed over a tooth that has been reduced slightly in size to accommodate. While crowns and veneers often share the same indications, crowns can be used when there is weakness to a tooth. The crown provides complete coverage over the tooth which can strengthen the tooth significantly. Traditionally many crowns were made of gold. Recent improvements in technology have allowed us to use crowns that are virtually indistinguishable from natural healthy tooth structure. Bridges are a form of treatment designed to replace missing teeth. This falls under the cosmetic dentistry category because a tooth missing in the visible part of the mouth can be more of an eyesore than nearly anything else. 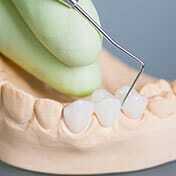 A bridge utilizes crowns on adjacent teeth for support. The results can appear as though there is a healthy tooth in the place where a tooth has been lost. Feel free to see the results of crown and bridge work in our smile gallery! Invisalign is the brand name for the leader in adult braces. While Invisalign certainly has it’s limitations, it has some incredible benefits over traditional adult braces. First, Invisalign is completely removed during meals so food does not become stuck in the braces. Second, since Invisalign can be removed at will cleaning is much easier. Many people who have worn traditional braces have found lasting white spots on teeth due to the challenge of cleaning around the brackets and wires. In addition, Invisalign is a much more esthetic approach. The liners are thin, comfortable, and clear. Many people will have no idea you are undergoing orthodontic treatment! If you would like to know more about this treatment, visit our services page on Invisalign. If you would like to know if this is something that would help you, feel free to contact us at any time electronically by clicking here! At Weldon General & Cosmetic Dentistry, we offer many other forms of cosmetic dentistry. Feel free to visit our services page to learn more about Botox, facial fillers, fillings and restorations, dentures, extractions, or implants.